Preheat your oven to 350 degrees and line a cupcake pan with cupcake liners. In a small mixing bowl, mix your graham cracker crumbs and sugar together. Then mix in your butter. Scoop about 2 tablespoons of your graham cracker mixture into your cupcake liners and press Down with your finger tips. In a separate mixing bowl, beat your cream cheese, sugar, and vanilla together until creamy. Then mix in one egg at a time. Scoop your cheesecake filling on top of your graham cracker crust, filling the cups about 3/4 full. Bake for 25-30 minutes and set in the fridge for 2 house to cool. Place your coconut onto a baking sheet, spread around and bake for about 6-8 minutes, tossing every 2 with a spatula. 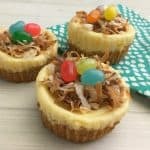 Place a small amount of toasted coconut onto each mini cheesecake and top with either malted milk eggs or jelly beans.